Redmond is a city in Deschutes County, Oregon, United States. Incorporated on July 6, 1910, the city is on the eastern side of Oregon’s Cascade Range, in the High Desert in Central Oregon. From Redmond there is access to recreational opportunities, including mountain biking, fishing, hiking, camping, rock climbing, white-water rafting, skiing, and golf. 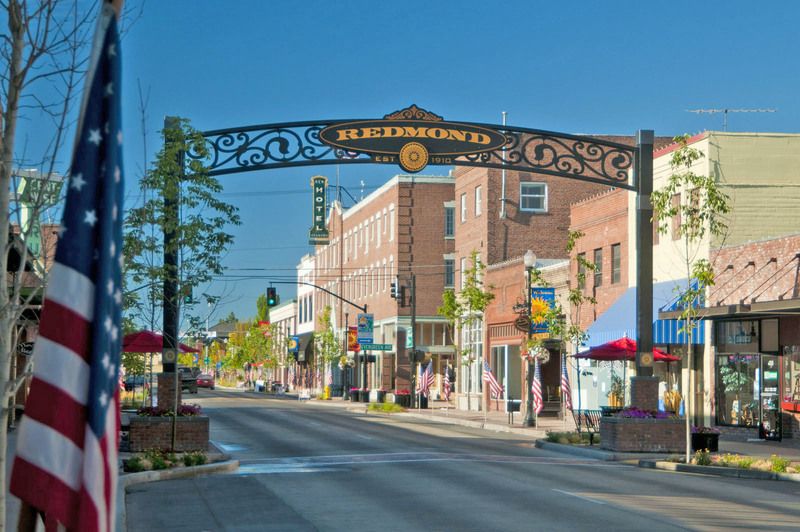 Redmond is a full-service municipality and one of the fastest-growing industrial and residential communities in Oregon. 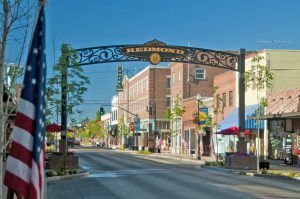 Redmond had a population of 30,011 in 2017, and the population continues to grow at a rate of about 6.7 percent each year. The city encompasses 15.5 square miles (40 km2) and is on a plateau, at an elevation of 3,077 feet (938 m). Redmond is 15 miles (24 km) north of Bend—the county seat of Deschutes County—144 miles (232 km) from Portland, 129 miles (208 km) from Salem—the capital of Oregon—and 126 miles (203 km) from Eugene. 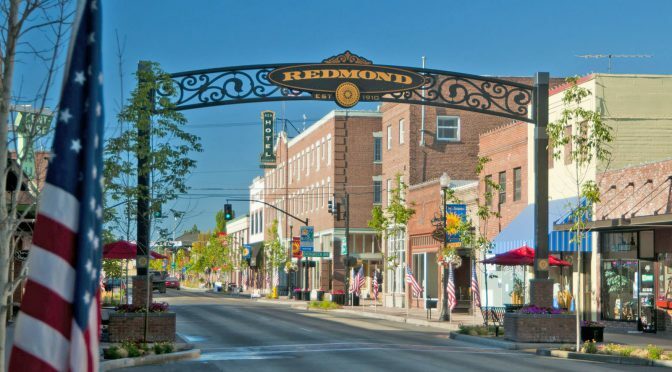 Redmond was named after Frank T. Redmond, who settled in the area in 1905. It was platted in 1906 by a company which would become part of Central Oregon Irrigation District building a canal. Electrification and the Oregon Trunk Railway reached Redmond in 1911. The rail link opened markets for farmers and merchants. By 1930, the town had grown to 1,000 and by 1940 had nearly doubled. In the 1940s, Redmond was a U.S. Army Air base and commercial air service was established at Roberts Field after World War II. In the 1950s, 60s, 70s, and most of the 80s, the population remained relatively static, growing slowly around a small commercial/retail center and manufacturing industry. However, during the 1990s, the population began to grow along with most of Deschutes County. Transportation to PDX know between 2000 and 2006, Redmond’s population grew 74.3%, making it among Oregon’s fastest-growing cities each year. This growth continued through 2006, increasing the population to 23,500. Its growth is fueled by employment and a lower cost of living. Transportation to PDX know as of the census of 2010, there were 26,215 people, 9,947 households, and 6,789 families residing in the city. The population density was 1,561.3 inhabitants per square mile (602.8/km2). There were 10,965 housing units at an average density of 653.1 per square mile (252.2/km2). The racial makeup of the city was 89.0% White, 0.4% African American, 1.3% Native American, 0.8% Asian, 0.2% Pacific Islander, 5.4% from other races, and 2.9% from two or more races. Hispanic or Latino of any race were 12.5% of the population. There were 9,947 households of which 38.6% had children under the age of 18 living with them, 48.7% were married couples living together, 13.9% had a female householder with no husband present, 5.6% had a male householder with no wife present, and 31.7% were non-families. 24.0% of all households were made up of individuals and 9.6% had someone living alone who was 65 years of age or older. The average household size was 2.61 and the average family size was 3.07. The median age in the city was 33.9 years. 27.9% of residents were under the age of 18; 8.8% were between the ages of 18 and 24; 28.8% were from 25 to 44; 21.9% were from 45 to 64; and 12.7% were 65 years of age or older. The gender makeup of the city was 48.3% male and 51.7% female. Redmond is the location of the region’s only commercial airline service airport, Roberts Field. Air carriers include Alaska Airlines, American Airlines, Delta Air Lines and United Airlines with service operated by their respective regional airline affiliates via code sharing agreements. These carriers provide nonstop service to Portland, Seattle, Denver, Salt Lake City, Los Angeles, San Francisco and Phoenix Transportation to PDX is accessible with Beaverton Airporter . The U.S. Forest Service operates an air base and training center for firefighting, and Butler Aircraft, a fixed-base operator, flies DC-7 aircraft for firefighting efforts. Redmond lies at the intersection of U.S. Route 126 and U.S. Route 97. The latter runs on an expressway alignment through the city known as the Redmond Parkway. A BNSF main line runs north-south through the city; there are numerous spurs off of the main line which serve industrial rail customers. The closest Amtrak service is in the town of Chemult, approximately 75 miles (121 km) to the south; this station is served by the Coast Starlight route.